Earn $33.24 in Rewards credit (3324 points) What's This? Your handlebars are a two way street, taking your inputs and transferring them to the bike, and the bike in turn feeding back through the bars information on available traction and road conditions. 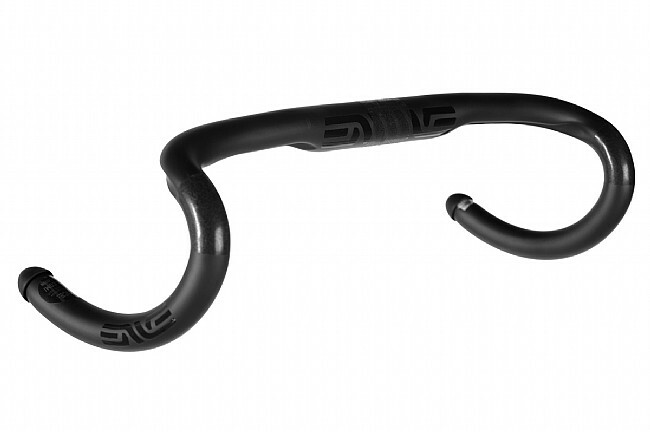 Both channels are equally crucial if you want to put in the best ride possible, so don't settle for anything less than ENVE's Compact Road Handlebar that has been optimally developed in all aspects. The unidirectional layup provides the utmost road damping while retaining stiffness and strength for both maximum comfort and efficiency. 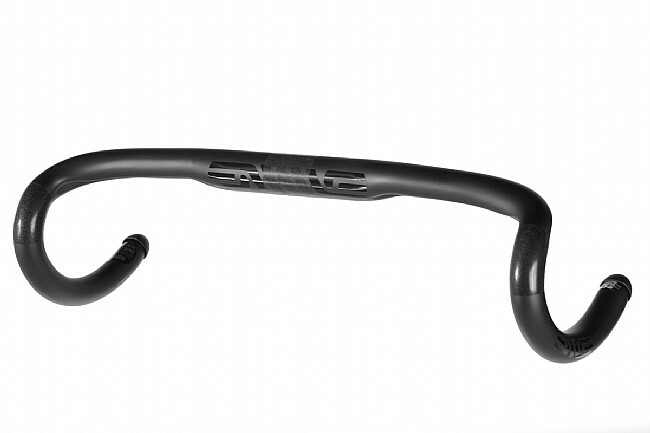 These bars feature a 79 mm reach and shallow 127 mm drop for those that prefer a tighter cockpit, and the thought-out bend provides lots of adjustment room for positioning shifters and angling the bars at exactly the rider's preference. Features dual recessed cable routing and ENVE's replaceable built-in Bar-End that provides better ergonomics when riding in the drops. I have these bars on two bikes, and if I could justify replacing perfectly good bars from other vendors, I'd get them for my other bikes with drop bars. The shape is ideal for me as I don't like too long a reach. They have just enough flex to do a good job with vibration reduction without feeling too flexy. The clamp areas for the stem and shifters seems to be roughed up enough to prevent slipping without over-torquing. I haven't had any problems with the bars twisting in the stem or with the shifters sliding down which is common with many other bars. I absolutely love the built in bar-end plugs. These are small rubber caps that are screwed into the ends of the bars. The rubber flips up over the bar tape after you've finished wrapping for a perfect finish. I don't know how many bar-end plugs I've lost over the years, but in the two years I've owned these bars, they've been flawless. I wish all bar manufacturers provided this. There are no position markers. As the drops are a constant curve, using a straight edge isn't a useful option. The curve radius between the tops and hood position is very tight. While this may give you a little more hand room, your cable housing isn't going to like it so much, particularly with two cables on the inside. The top is slightly flattened, which is nice for hand comfort. The flat area is apparently meant to be placed at a positive angle, which is rather anti-aero. Placing them parallel to the ground puts the end of the drop area past vertical. The captive bar-end plugs seem an unnecessary gimmick and potential failure mode. You don't get a spare. They do a good job at vibration damping, but have a good amount of flex, particularly in the drops. With all things Enve, they're pricey. However, I can't say enough how much I'm liking these guys. I'd been on Ritchey WCS Evo something or other for years and just got sick of the weird bend in the drops. 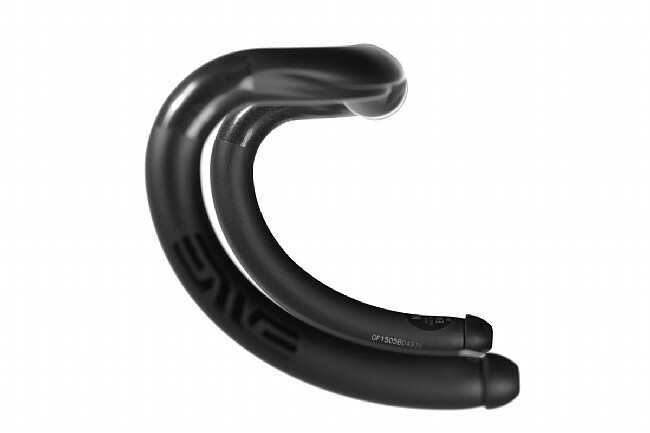 The Enve bars provide a ton of hand placement options and the reach is perfect for me. Definitely would recommend these if you're looking for a compact bar. Best bar on the market hands down. As a competitive cyclist who spends a lot of hours on the bike i was struggling with ulnar nerve issues and discomform on long rides. This bar is perfect, zero wasted space. The shaping of the bar is brilliant and natural. This is a steep price but considering this is one of the critical contact points i this is worth the price. In regards to vibration dampening that is highlly subjective but their barstem combo feels great. Compact road bar that looks and feels great. I made the switch from an alloy bar to the Enve compact road bar and haven't looked back. It did take a little bit to get over sticker shock but that is just what a high end carbon bar costs. It shaved weight off my bike and eliminates a noticeable amount of what I call, road chatter, definitely smooths out your ride and you're not as beat up on longer rides - 60-100 miles. They also look incredible!! pictures don't do it justice. This is a small detail but their bar end plug is genius! They are replaceable and make for a super clean look after you put tape on. I was so happy with this purchase I ended up purchasing Enve seat post and stem...Im set for years to come.